Please read this leaflet carefully before you start using LINCOTAJ Injection. This leaflet answers some common questions about LINCOTAJ Injection. It does not contain all the available information. It does not take the place of talking to your doctor or pharmacist. All medicines have risks and benefits. Your doctor has weighed the risks of you using LINCOTAJ against the benefits it is expected to have for you. Use LINCOTAJ as instructed and follow the advice given in this leaflet. LINCOTAJ is an antibiotic used to treat serious infections in different parts of the body caused by certain bacteria. LINCOTAJ works by killing or stopping the growth of bacteria causing your infection. The specific infections for which LINCOTAJ is used include: ear, throat and lung infections; skin infections; bone and joint infections; and infections of the blood. LINCOTAJ will not work against viral infections such as colds or flu. Your doctor may have prescribed LINCOTAJ for another reason. Ask your doctor if you have any questions about why LINCOTAJ has been prescribed for you. Symptoms of an allergic reaction may include skin rash, itching or difficulty in breathing, wheezing or coughing (anaphylactic reactions). If you are not sure if you have or have had an allergic reaction to LINCOTAJ, check with your doctor. LINCOTAJ may pass into the breast-milk so alternatives should be discussed with your doctor. LINCOTAJ is not to be given to a newborn baby. If you are not sure about the use of LINCOTAJ Injection, talk to your doctor. Your doctor will discuss the risks and benefits of using LINCOTAJ during pregnancy. If you have not told your doctor or pharmacist about any of the above, do so before you start using LINCOTAJ Injection. LINCOTAJ should not be given with erythromycin since these two medicines may interact. LINCOTAJ should not be given with certain medicines due to physical incompatibility with LINCOTAJ. These include kanamycin, novobiocin and phenytoin. Interference between LINCOTAJ and neuromuscular blocking medicines (muscle-relaxing medicines) may occur. Your doctor or pharmacist can tell you what to do if you are already taking any of these medicines. They also have a more complete list of medicines to be careful with or avoid while using LINCOTAJ. LINCOTAJ is administered by an infusion into a vein or an injection into a muscle. This will be done by a doctor or a nurse. The dose and frequency of LINCOTAJ that your doctor prescribes for you depends on your medical condition. Your doctor will continue giving you LINCOTAJ for as long as your condition requires. If a dose of LINCOTAJ is missed, the next dose should be given at the normal time it is due. Your doctor will ensure that you receive the correct dose of LINCOTAJ. for advice or go to Accident and Emergency (Casualty) at your nearest hospital if you think that you or anyone else may have been given too much LINCOTAJ Injection. Do this even if there are no signs of discomfort or poisoning. You may need urgent medical attention. Keep the telephone numbers for these services handy. Have the LINCOTAJ Injection box or this leaflet available to give details if needed. If you are about to start taking any new medicines, tell your doctor or pharmacist that you are taking LINCOTAJ. Tell all doctors, dentists and pharmacists who are treating you that you are being treated with LINCOTAJ. If you get severe diarrhoea, tell your doctor, pharmacist or nurse immediately. Do this even if it occurs several weeks after LINCOTAJ has been stopped. If you get a sore, white mouth or tongue while taking or soon after stopping LINCOTAJ, tell your doctor. Also tell your doctor if you get vaginal itching or discharge. This may mean you have a fungal/yeast infection called thrush. Sometimes the use of LINCOTAJ allows fungi/yeast to grow and the above symptoms to occur. LINCOTAJ does not work against fungi/yeast. If you become pregnant while you are using LINCOTAJ, tell your doctor. If you are about to start taking any new medicines, tell your doctor and pharmacist that you are on LINCOTAJ. Tell all doctors, dentists and pharmacists who are treating you that you are on LINCOTAJ. Check with your doctor as soon as possible if you have any concerns while using LINCOTAJ, even if you do not think your concerns are connected with the medicine or are not listed in this leaflet. All medicines can have side effects and LINCOTAJ may have unwanted side effects in a few people. Sometimes they are serious, most of the time they are not. You may need medical treatment if you get some of the side effects. Tell your doctor or pharmacist as soon as possible if you do not feel well while you are using LINCOTAJ. LINCOTAJ can also cause: changes in blood cells, lowering of blood pressure. Tell your doctor immediately if you notice any of the following side effects, particularly if they occur several weeks after stopping treatment with LINCOTAJ. severe abdominal cramps or stomach cramps. LINCOTAJ can cause bacteria which is normally present in the bowel and normally harmless, to multiply and cause the above symptoms. These are rare but serious side effects of LINCOTAJ and you may need urgent medical attention. This is not a complete list of all possible side effects. Some people may get other side effects while being treated with LINCOTAJ. Normally your doctor will get your LINCOTAJ from the hospital pharmacy or their consulting rooms. If however, you do take your LINCOTAJ from the pharmacy to your doctor, it is important to store your LINCOTAJ in a safe place away from light and away from heat (below 25°C). Do not leave your LINCOTAJ in a car. If for any reason you take your LINCOTAJ home, always ensure that it is stored in a place where children cannot reach it. Do not freeze LINCOTAJ. If your doctor stops treating you with LINCOTAJ, your hospital pharmacist will dispose of any unused medicine. The expiry date is printed on the carton. Do not use LINCOTAJ after this date has passed. LINCOTAJ is a clear, colourless or almost colourless solution in a glass vial. LINCOTAJ is supplied in cartons containing 5 vials. The active ingredient in LINCOTAJ is lincomycin hydrochloride. 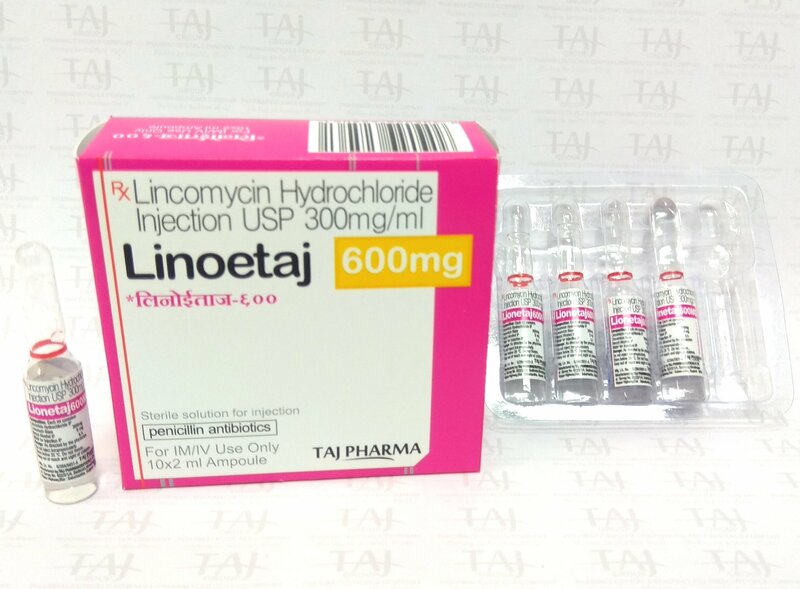 Each 2 mL vial contains lincomycin hydrochloride equivalent to 600 mg of lincomycin. LINCOTAJ also contains benzyl alcohol and Water for Injections.